A couple of weekends ago our Basque club had its annual Mus tournament. Mus is a Basque card game, widely played in the Basque Country, and also in the rest of Spain and to a lesser extent in France. It is a vying game. The word Mus is believed to come from the French word mouche (“fly”), from Latin mussula. In Spain it is the most played card game, spawning several Mus clubs or peñas and becoming a staple game among college students. It is not uncommon to hear the Basque terms, such as órdago (from Basque hor dago “there it is” used by Spanish speakers, often without them being aware of the literal meanings of the terms and phrases. Basque emigrants carried the game to other countries such as the USA and Australia, where it is played in Basque clubs. Nowadays there is an international Mus tournament, in addition to many national and regional competitions. There were about 8 teams of men competing in our tournament. There is always a lot of shouting, insulting and salty Basque language. It is traditional to serve them tripe and pigs feet for lunch. One of the other women in the club makes this dish and also flan for the men. My husband had 5 bowls of tripe and pigs feet! It’s his favorite dish of all time. I was in charge of making a fish dish, salad and another dessert. 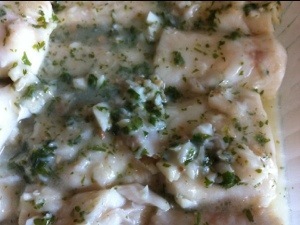 I made Merzula en Salsa Verde or Hake in Green Sauce and for dessert Gateau Basque. Surprisingly I had never made salsa verde before. I had found hake at of all places Costco! 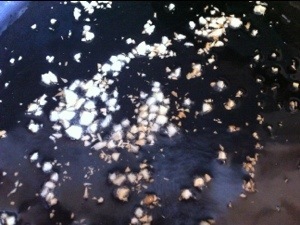 It was frozen, but in Idaho fresh fish isn’t that easy to come by and definitely not hake. One side note…always taste the wine before you use it. I was in a hurry and didn’t and had to make another batch of the sauce. The wine was really bad! 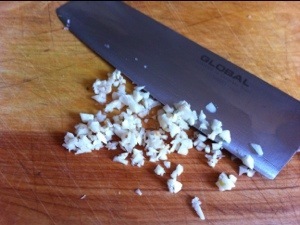 Finely chop 2 cloves garlic. 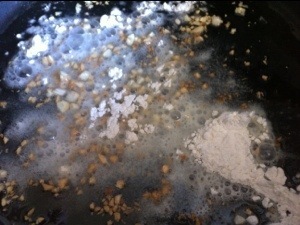 Sprinkle 1 tablespoon of flour over the garlic and mix thoroughly, 1 to 2 minutes. 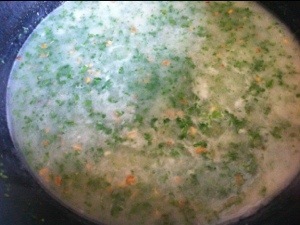 Add 1 cup of water, 1/2 cup of clam juice, 1/2 cup white wine, 2 tablespoons chopped fresh parsley and salt to taste. Decrease the heat to medium and cook the sauce, stirring occasionally, until the sauce is slightly thick, about 5 minutes. Add more cold water if you think the sauce is too thick. 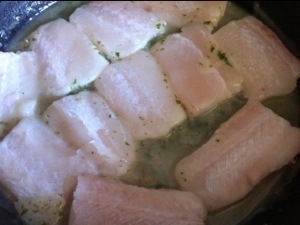 Add the hake to the pan, in a single layer. Cook the fillets in the sauce for 2 minutes, swirling the pan constantly and sliding the pan on and off the fire until the hake gives off some of their gelatin. 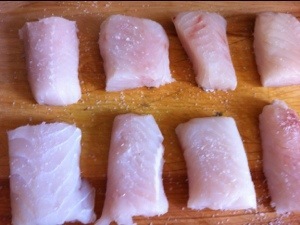 Flip the fillets once and cook until the fish is opaque, but not overcooked about 2 or 3 minutes on the other side. The sauce should be a very light green and slightly thick, but still smooth and light.